The vast ocean invites you on a refreshing journey. The Sea Yacht Cruise 3D Screensaver will delight you with a peaceful voyage to the open sea on a luxurious yacht. The sky with its feathery clouds and rippling water will be your only companions on this relaxing trip. This yacht can be a perfect getaway to solitude as you listen to the soothing sounds of the sea. If you’re look for a screensaver to loosen your taut nerves, then you’ve found just what you need in Sea Yacht Cruise! The Sea Yacht Cruise 3D Screensaver comes with dual monitor support. If you use two monitors, you’ll see the true beauty of going under sail. Since there is no loading screen, Sea Yacht Cruise reveals the allure of the sea immediately. Install it and set sail today! The romance of the open sea awaits you! After you have downloaded and installed the Sea Yacht Cruise 3D Screensaver it operates in the trial mode. You will see two reminders to purchase and register the full version. The first appears each time when the screensaver finishes its operation and the second appears after one minute of screensaver operation. 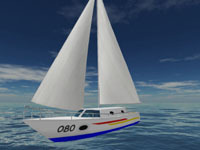 To obtain a full, unlimited version of the Sea Yacht Cruise 3D Screensaver, you must purchase it. By purchasing this software you become a registered user. As a registered user you will have all trial limitations removed and all program updates provided for free, without any charge.